One of our customers runs a Jeep Cherokee Sport with a TM-6.5 plow on it doing driveways. 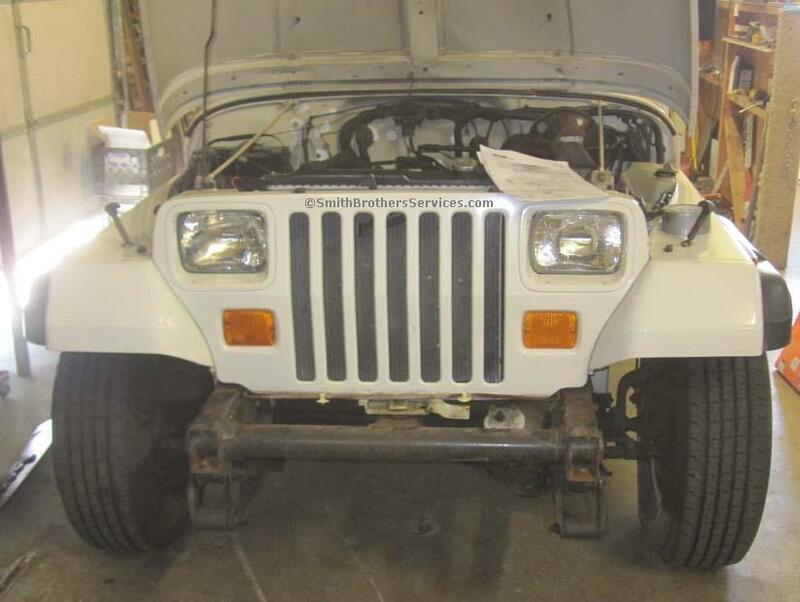 Last year he came across a good deal on a 1995 Jeep Wrangler Rio Grande, and bought it with plans to make it a back up vehicle in case of problems with the Jeep Cherokee Sport. We were going to put a plow on it in the spring of 2010, but it didn't work out. Everything fell into place when he got a great deal over the summer on an almost new TM-6.5 plow minus the vehicle side components. 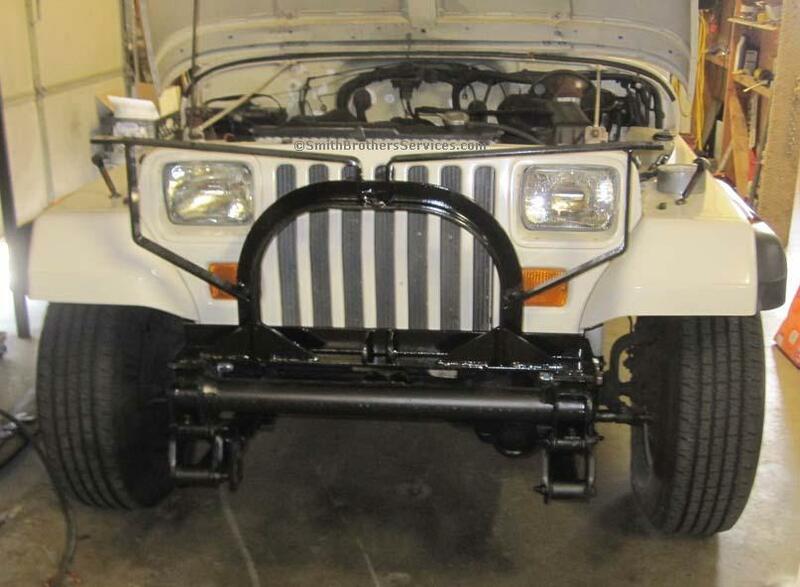 The 1995 Jeep Wrangler is supposed to get a Meyer Custom Classic mount, with an ST Series plow. 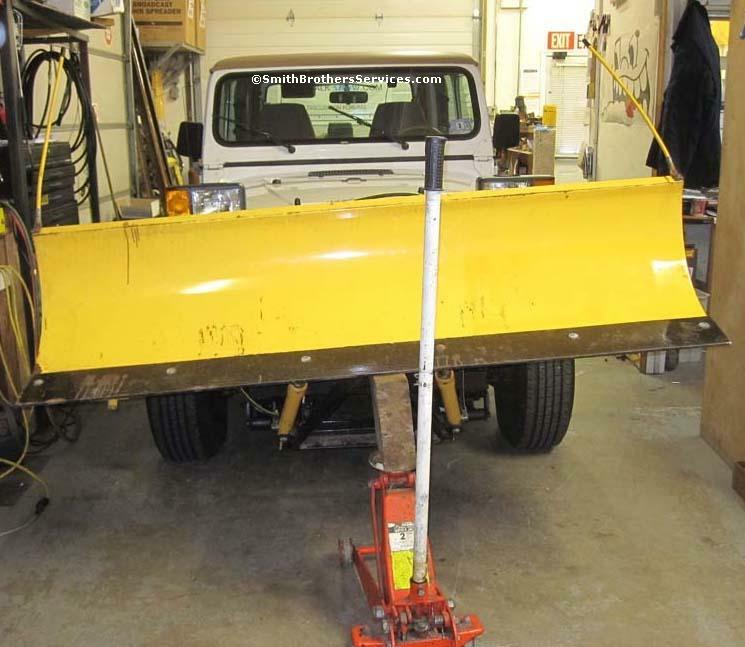 Since he had the like new Meyer TM-6.5 plow, he wanted to be able to use it on either of his Jeeps. 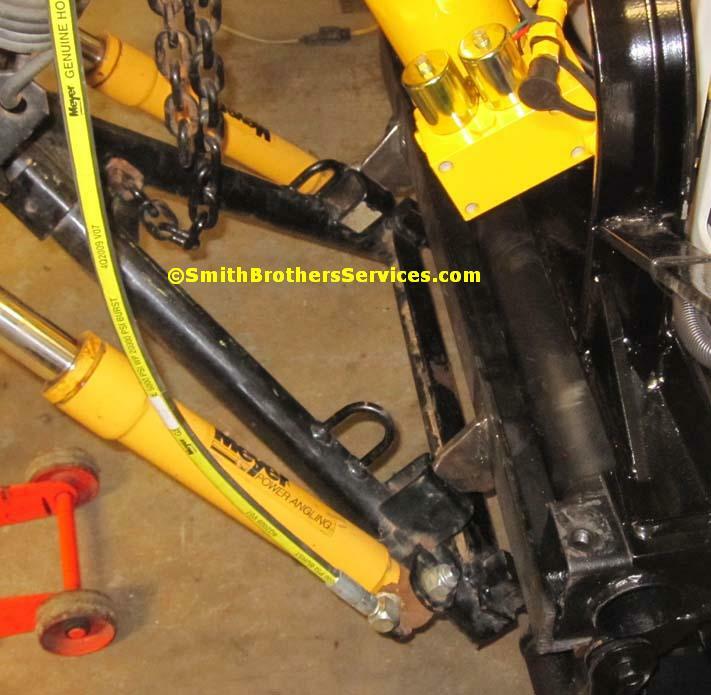 The problem is that Meyer never made a TM mount for the 1987 - 1996 Wrangler. That is where we come in. Here we started by removing the bumper and trim up front. 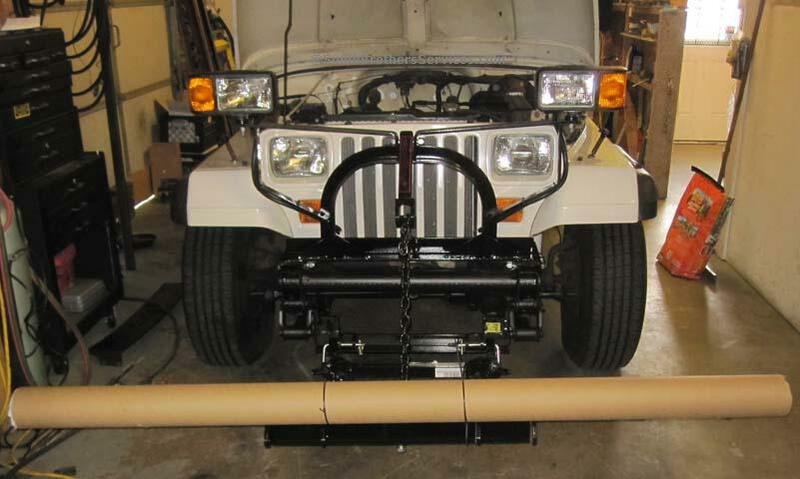 We gave the front framework a coat of 3M Paintable Undercoating, and mounted the Lift Frame. We didn't have the TM-6.5 plow to do the mock up, so we took a new TM A Frame and Pivot Bar off the shelf, and used a tube that happened to be 6'8". 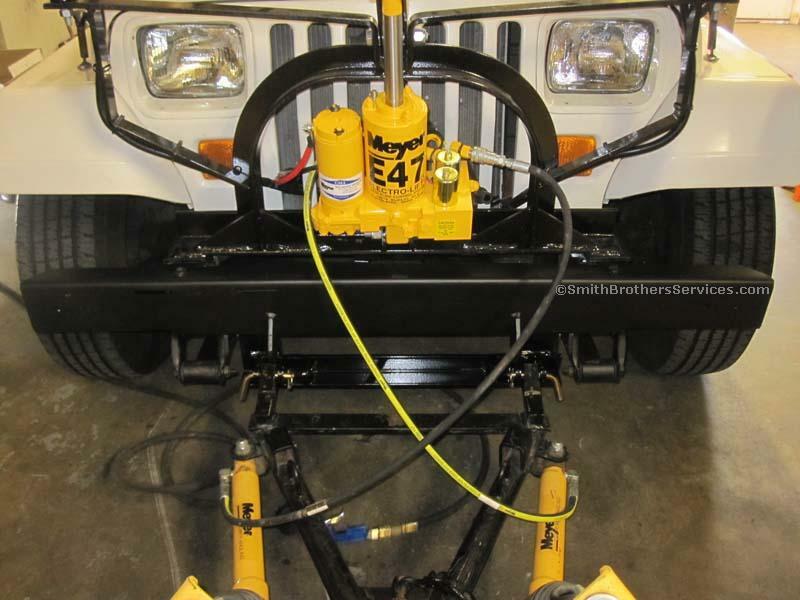 Since there are no stops on the mount, the plow can go up until it hits the bumper, just like the ST that is meant for the Jeep. So we took a piece of 3/8" x 2-1/4" x 2-1/4" angle iron and cut some stops from 1/2" plate and welded them on. 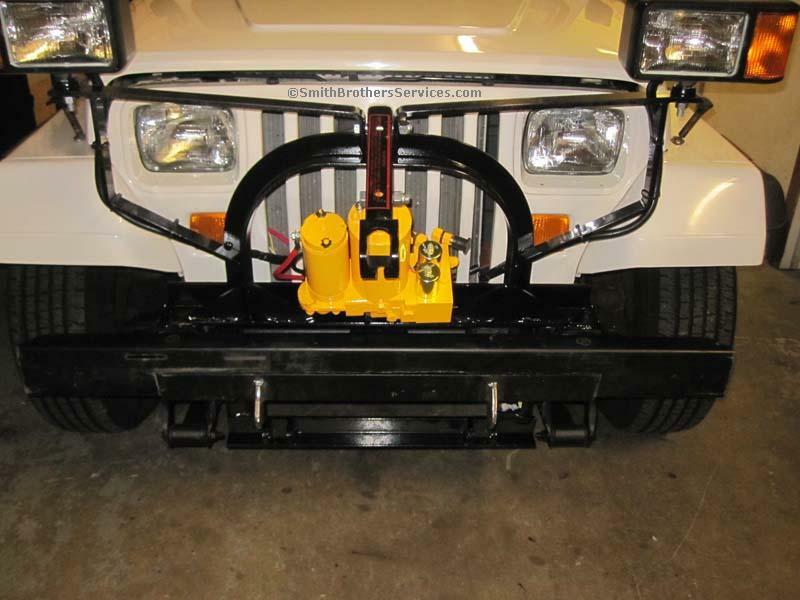 We used the existing lower bumper mounting holes to attach it to the Jeep Wrangler frame, and cut it to the width of the Jeep frame. This is because the Meyer TM A Frame is much shorter than the ST A Frame, and there was a chance that the Lift Arm could hit the back of the Moldboard when stacking snow. Now it can't. 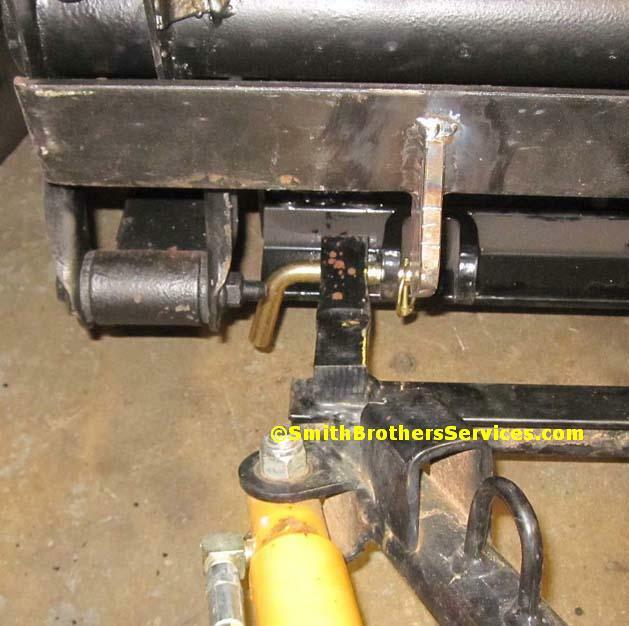 The customer likes to keep his vehicles stock in appearance, so we tried to keep that in mind when making the stops, instead of going with a fancier design like we thought of first, along the lines of a pre-runner tube on the bottom of the framework up front. We could have modified the TM A Frame, but then it would not work properly if mounted on the Cherokee. Here you can see that the TM A Frame mounting ears happen to line up just outside of the ST Clevises. Perfect! Then we decided to cut out the bottom of the stock Jeep Wrangler bumper so it fit around that piece of heavy 3/8" angle iron we mounted the 1/2" stops to. Then we tacked welded them together. Here it is fully welded, ground, smoothed, and primed. Painted satin black. Those two white lines in the upper left on the bumper are the original slots for mounting the license plate. 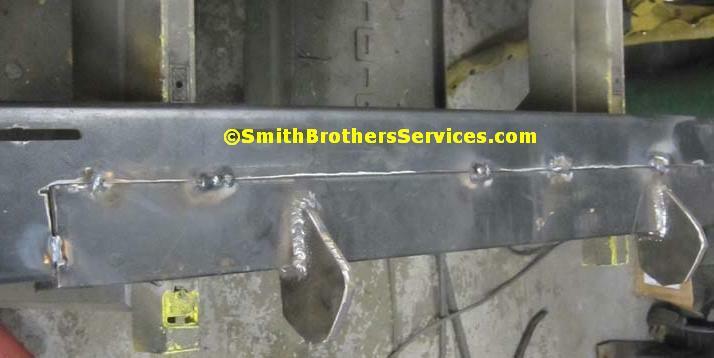 Here you can see we welded another half clevis to the outside of the ST clevises, to mount the TM instead. We left the original ST clevises so that he can run an ST plow in the future if need be. 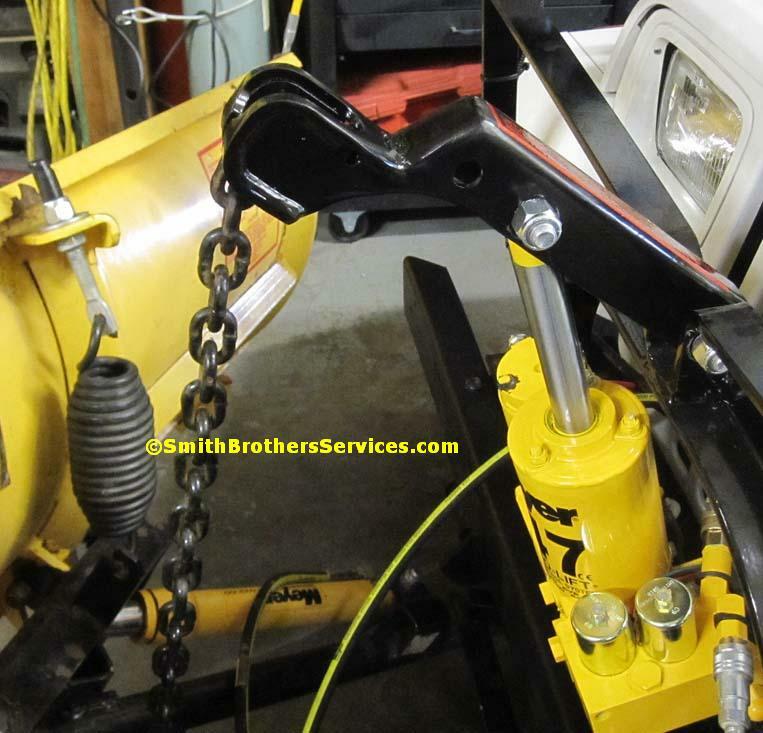 We modified the Lift Arm because the chain was too short on the plow. 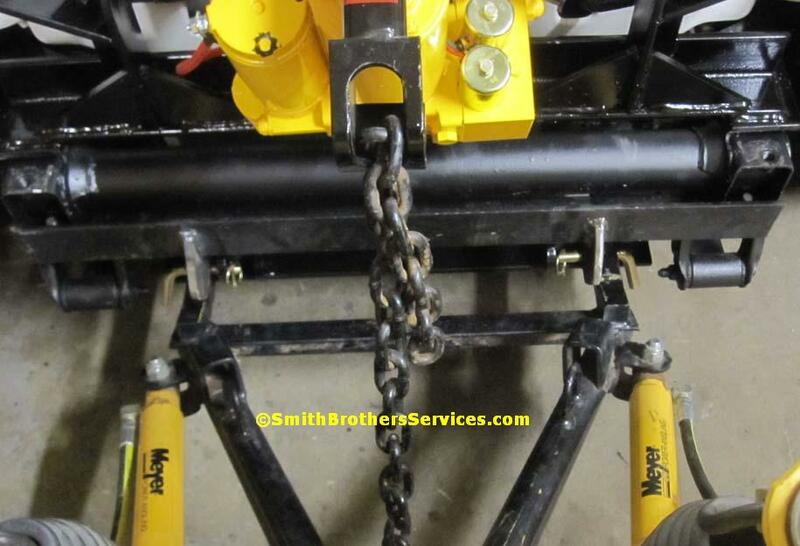 We could have lengthened the chain, but this way any TM plow will mount up. 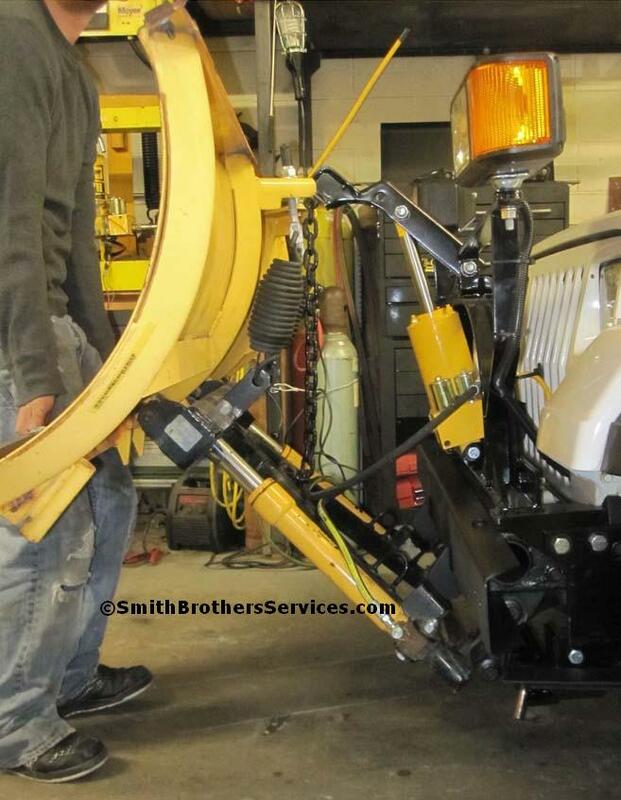 Showing how the lift stops on the plow line up with the ones we made for the bumper. 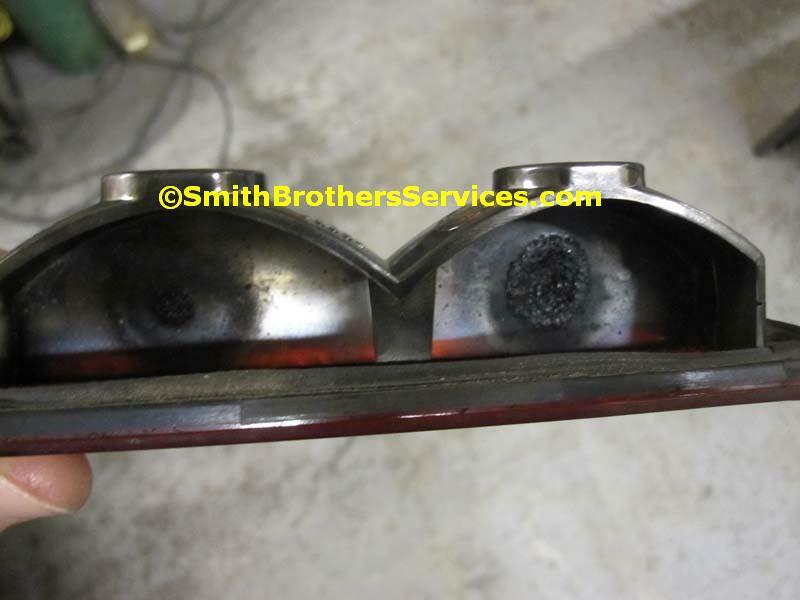 While looking over the Jeep we found the 3rd brake light did not work. Oversized bulbs melted the lamp housing. We put the correct bulbs in. The TM plow is 85.37 pounds lighter. It may not seem like a lot, but when you put that 85 pounds out 3 feet in front of the Jeep, it makes a BIG difference. More Jeep Wrangler installs here.